The Polaroid Z2300 comes tinged with a strong glow of nostalgia. Sparked by the memory of the Polaroid cameras of earlier decades, whose instantly-developed film photos have become iconic images of the 70s and the 80s, this point-and-shoot device is designed to bring back memories of the instant camera classics of old, while introducing new generations to the thrill of instantly-produced physical prints of digital photos. Of course, today’s photographers expect much more. The Z2300 is also a digital camera, with a slot for a 32 GB SD card for saving photos and uploading them to your favorite social media sites. If you’re wondering if the new Z2300 works to bring back the memories and the magic of the past while keeping up with today’s quality expectations, you’ll find everything you need to know in our Polaroid Z2300 review below. While the built-in instant printer is surely the biggest draw of the camera, let’s check out the detailed technical specifications of the camera below in this Polaroid Z2300 review. The key feature and main appeal of what otherwise appears to be a rather large point-and-shoot digital camera is, of course, the Polaroid instant printing. This feature is associated with Polaroid cameras and allows you to instantly capture a unique moment and share it in print with your friends. The camera uses ZINK paper, which contains the ink necessary to print the photo within the paper itself. This means that just like the early Polaroid cameras, there is no need to worry about ink or other printer supplies. The photos themselves are 2 x 3 inches, relatively small but also fun for sharing. The ZINK photo paper used by the camera also has a removable adhesive backing if you would like to turn your photos into a sticker and each photo has a smudge-proof and water-resistant coating. The camera takes around one minute to print a photo from start to finish. The image quality produced by this camera far exceeds that of the instant cameras of the past. However, because the camera’s photo quality is only 10 megapixels, the quality is less than what one might expect from other digital cameras available on the market today. In addition, there are two factors to consider when assessing image quality in a Polaroid Z2300 review: the printed image and the digital image. Printouts are clear and colorful, if small; they may be less accurate when reproducing a black-and-white digital photo. Because of the small size of the printed photos, some fine details of the images may be lost in the printout. However, the original digital image preserved in the camera’s memory does retain these details; it is an artifact of the small size of the attached printer rather than the photo’s original quality. Digital image quality is solid for a 10-megapixel camera. In addition, the camera includes a macro mode which allows you to shoot close-ups and capture additional detail. The camera includes only digital zoom rather than optical zoom, which can degrade image quality, and does not have automatic image stabilization. Unlike Polaroids of the past, the Z2300 doesn’t automatically print every picture; you choose which pictures to print, which to save and which to discard. 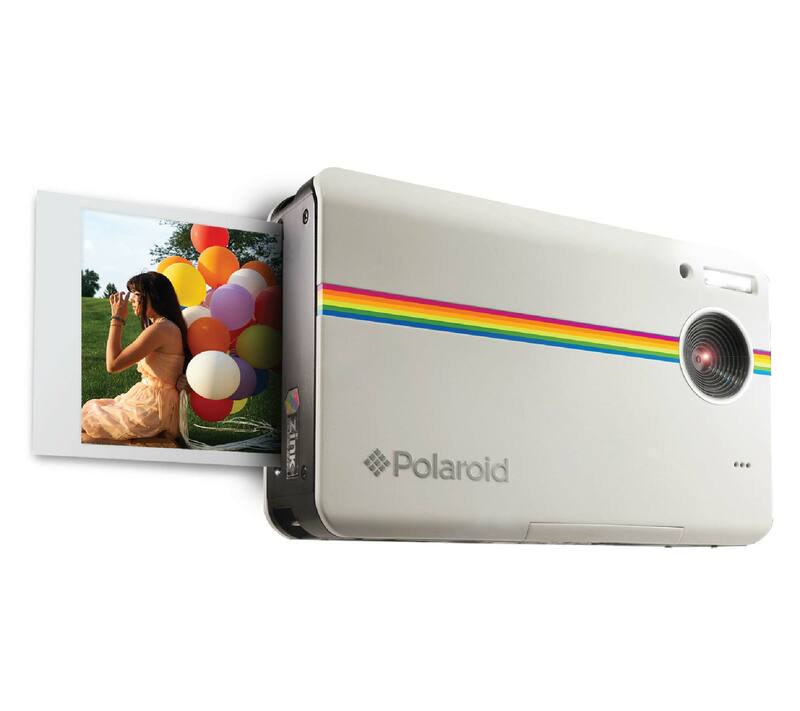 The camera comes in an assortment of bright body colors with a rainbow Polaroid logo accent. Because of the built-in printer, the Z2300 is significantly bulkier than other digital point-and-shoots. However, it’s also significantly smaller than the instant cameras of past decades. The viewing screen on the back is large and useful in framing photos. To the right of the viewing screen is the latch to the paper storage compartment. It is somewhat easy to accidentally open the compartment. This does not, however, affect the quality of the paper or the photos produced. The camera uses a lithium-ion battery, which can print 15 consecutive photos or take around 300 images before requiring a recharge. Heavy, bulky camera due to built-in printer. Relatively short battery life, especially if printing photos. Some printed photos can have a bluish or dark tint, or a lack of clarity. Limited zoom options and no image stabilization. Printed photos are small, the size of a business card. The Polaroid Z2300 is built for fun, parties and good times. From young people who never used a digital camera to older generations who fondly remember the past, this camera is meant for enjoyable events and celebrations. The printing mechanism is what makes this camera an enjoyable treat. It is not a serious camera intended for photographers who want to produce photos of professional or near-professional quality. Those who are looking more for picture quality than picture entertainment are likely to be disappointed. However, for travel photos, scrapbooking, party events that include making photos into stickers and other celebratory occasions, the camera can add fun and excitement, while retaining solid-quality digital photography and video. This camera is great fun at a party, brings back nostalgic memories and can add enjoyment to any number of events with instant-printed photos and stickers. However, if traditional photo quality and capturing the best digital images are more important, this camera may not be the most optimal choice. There are many great cameras, including point-and-shoot models, that offer greater photographic quality. In short, if fun is your priority, the Polaroid Z2300 may be right for you. If serious photography is your goal, you’re probably better off looking elsewhere. If you have this camera yourself, please share your own experiences and thoughts with us!